The myelodysplastic syndromes (MDS) comprise a heterogeneous group of malignant clonal hematopoietic stem cell disorders characterized by cytomorphological atypia (dysplasia) and signs of progressive bone marrow failure. , Cytopenias are the lleading clinical feature of patients with MDS, transfusion-dependent anemia being here the most frequent problem. MDS is a disease of the older adult with a median age of 70 years and a male preponderance. Progression to secondary acute myeloid leukemia (sAML) occurs in a significant proportion of patients with MDS, but the risk for transformation strongly depends on the subtype of disease. The updated World Health Organization (WHO) blue book contains major changes regarding classification and definition of MDS. , Cytopenia here is defined as <10 g/dL hemoglobin, <1.8 × 10 9 /L neutrophils, and <100 × 10 9 /L platelets. MDS associated with isolated del (5q). Amongst tshese three disorders, the subentities RN and RT have been newly defined as isolated dysplasia of the neutrophilic cells (RN) or megakaryocytes (RT), respectively. Like RA, all cases of RCUD have a good prognosis with prolonged survival obviously due to the very low amount of blast cells. The overall risk for transformation into sAML is only about 2%. In the very rare instances of marked cytological dysplasia without cytopenias, the term "idiopathic dysplasia of undetermined significance (IDUS)" seems appropriate. Some patients, however, show chronic cytopenias without dysplasia, which implies a descriptive diagnosis of "idiopathic cytopenia without dysplasia (ICUS)". RARS is a well-defined subgroup of MDS with an increase in ring sideroblasts (>15% of all erythroid cells), very low blast cell numbers, and lack of major atypia in nonerythroid cell lines. Only 1-2% of cases transform into sAML and the prognosis, therefore, is relatively good. RCMD is a type of MDS with dysplastic changes in at least two of the three myeloid lineages. Dysplastic changes must be present in <10% of all cells of the affected lineage. The blast cell count is low and the overall median survival of patients is about 30 months [Figure 1] and [Figure 2]. RAEB is a prognostically unfavorable subtype of MDS with blast cell counts not exceeding 19% in blood and/or bone marrow. The subtype RAEB-1 is defined by 5-9% blast cells in the bone marrow and up to 4% blast cells in the peripheral blood, while RAEB-2 is defined by 10-19% blast cells in the bone marrow and up to 19% blast cells in circulation. Transformation into sAML is seen in about one-third of patients with RAEB-2 and the median survival, therefore, is only 9 months. This entity lacks features appropriate for classification into any other MDS category, for example, patients exhibiting typical picture of RCUD or RCMD, but with 1% circulating blast cells would qualify for MDS-U. This entity has been included in the updated classification system of MDS due to its very characteristic clinicopathological features and an excellent prognosis (median survival is about 145 months). Definition includes an isolated anemia combined with thrombocytosis, low blast cell counts, and almost specific cytomorphology of megakaryocytes which are small and carry non- or hypolobated nuclei. Cytomorphological evaluation of blood and bone marrow smears allows prompt detection of significant dysplasia in all three myeloid cell lines, while histological analysis is crucial for detection of microarchitectural alterations of the bone marrow, but cannot be recommended to reveal subtle dysplastic changes in neutrophilic and erythroid cells. Atypia of megakaryocytes, however, can easily be detected in both smear preparations and histological sections. Dyserythropoiesis shows alterations of the nucleus (megaloblastoid changes, multinuclearity, budding, and internuclear bridging) and cytoplasm (vacuolization, periodic acid-Schiff positivity, and mitochondrial iron deposits = ring sideroblasts) of erythroblasts. Dysgranulopoiesis shows primarily nuclear hypolobation (pseudo Pelger anomaly), but nuclear hypersegmentation, cytoplasmic hypogranularity, Auer rods More Details (as a very rare finding), and microcytosis can also be detected. Megakaryocytic dysplasia is characterized by both micro- and macrocytosis with often very prominent pleomorphism of the cells. The small, immature-appearing megakaryocytes contain non- or hypolobated nuclei. Small megakaryocytes with non-lobated hyperchromatic nuclei are termed micromegakaryocytes and are a prominent feature of chronic myeloid leukemia, but can also be seen in MDS. Tryptase: Mast cells, atypical basophilic granulocytes. 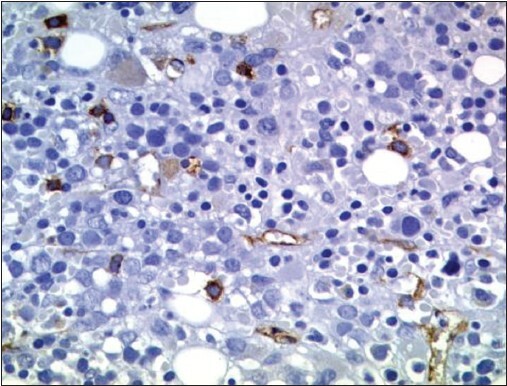 MDS with an associated systemic mastocytosis (SM-AHNMD). 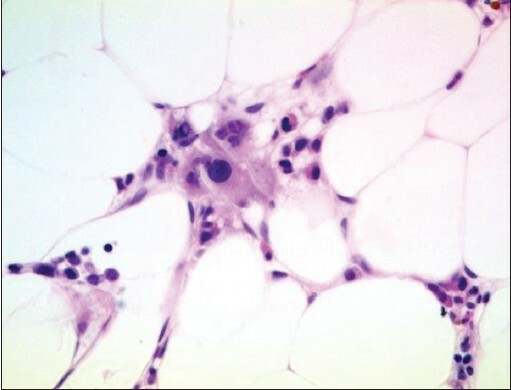 An extremely hypocellular bone marrow with marked increase in adipocytes is seen only in a small minority of MDS cases (<5%). Such findings usually are initially interpreted as toxic myelopathy or as aplastic anemia. It is therefore crucial in all cases with pronounced aplasia to perform at least two immunostains, namely CD34 and CD61. CD34 is essential to detect and enumerate even very small numbers of blast cells suggesting a diagnosis of MDS-hypo rather than (reactive) aplastic anemia. Considering the overall very low cellularity in MDS-hypo, diagnosis of RAEB-1 or RAEB-2 is more often considered than any other subtype of MDS. In cases with higher blast cell numbers, clear distinction from hypoplastic AML may be extremely difficult. MDS-hypo can only be diagnosed on the basis of bone marrow histology. 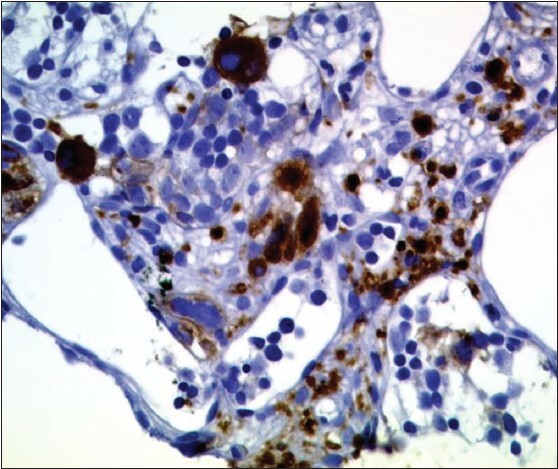 However, presence of atypical circulating neutrophils may be regarded as an important indication to analyze histological section thoroughly [Figure 3]. About 10% of MDS cases exhibit marked reticulin or even collagen fibrosis (at least Grade 2), and therefore, qualify to be included in the subcategory of fibrotic MDS. The term "MDS with myelofibrosis", although stated in the WHO blue book, should be avoided in order not to produce confusion with primary or secondary myelofibrosis, diseases which belong to the group of myeloproliferative neoplasms. In the majority of MDS-F cases there is an excess of blast cells leading to an overall very bad prognosis, which is also in part due to limited therapeutical options. Therefore, a diagnosis of MDS-F, subtype RAEB-F, can be established in most cases. Again, the separation of RAEB-F from hypoplastic AML may be extremely difficult or almost impossible [Figure 4]. An association of MDS with systemic mastocytosis is rare, but has been repeatedly described. The disease should be adequately termed SM-AHNMD of SM-MDS subtype and can be diagnosed with certainty only on the basis of thorough histological evaluation of core biopsy specimens of the bone marrow. SM usually is an isolated bone marrow mastocytosis with minor degree of bone marrow infiltration and the MDS dominates the picture. 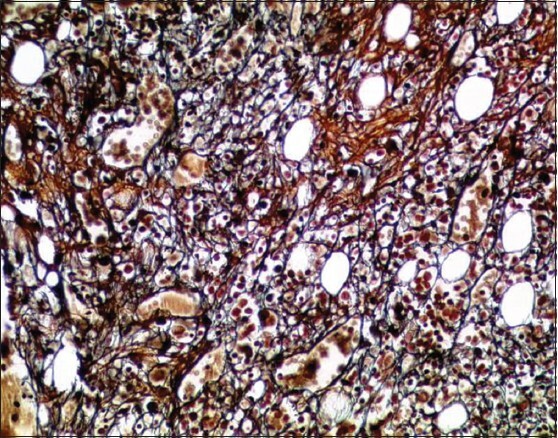 In such cases, immunohistochemical investigation with antibodies against mast cell-related antigens like tryptase and CD117(KIT) is necessary to achieve the correct diagnosis. Demonstration of a few small, compact mast cell infiltrates expressing CD25 (abnormal immunophenotype of mast cells not seen in reactive states) and presence of the activating point mutation KIT-D816V can be of major help to finally confirm the diagnosis of SM-MDS. Almost all major subtypes of MDS have been seen in association with SM-RARS, RCMD, RAEB, and MDS with isolated del (5q). In a minority of cases SM shows a diffuse-compact infiltration of the bone marrow and the MDS is hard to detect. Since in smoldering and aggressive SM, which often show extensive infiltration of the bone marrow, a minor degree of dysplastic changes in blood cell precursors is included in the definition of the basic disease, diagnosis or exclusion of MDS here can be extremely challenging. For diagnosis of MDS it is crucial to be sure that dysplastic cell changes are due to a clonal stem cell disorder and not related to a variety of nutritional or toxic effects. Most important here are vitamin B12 or folic acid deficiencies. Rarely, the application of hematopoietic growth factors may lead to a significant increase in progenitor cells almost indistinguishable from MDS RAEB-2 or even overt AML. In difficult case, repeated investigations of the bone marrow, including cytogenetic studies may be necessary to finally be able to establish a diagnosis of MDS. Cytogenetics and molecular findings may be of great importance to avoid misinterpreation of dysplastic changes since more than 50% of patients with MDS have such cytogenetic or molecular abnormalities, which clearly shows the clonal or neoplastic nature of the morphological changes. Another important issue is the separation of RAEB-2 from overt AML. The threshold has been defined as a maximum of 19% blast cells for RAEB-2 and at least 20% for diagnosis of sAML, but blast cell counts around this value can be very difficult to be determined with certainty. Histologic investigation of the bone marrow may be of help in such borderline cases. Demonstration of at least one compact blast cell infiltrate is sufficient for the diagnosis of AML. Finally, AML with myelodysplasia-related changes has to be considered. This is a special type of AML with at least 20% bone marrow blast and with or without a prior history of MDS. However, patients should not have a history of cytoreductive or radiation therapy, which would qualify the disease to be subcategorized as therapy-related myeloid neoplasm/AML. Combined investigation of smear preparation of blood and bone marrow together with histological/immunohistochemical evaluation of a core biopsy of the bone marrow are the optimum prerequisites to be able to establish a diagnosis of MDS. A limited panel of antibodies (CD14, CD34, CD61, and tryptase) has been shown to be sufficient in the daily work-up of the hematopathologist to be able to assess or exclude most subtypes of MDS histologically. Moreover, hypoplastic and fibrotic subvariants of MDS and SM-MDS are exclusive histological diagnoses. 1. Bennett JM, Catovsky D, Daniel MT, Flandrin G, Galton DA, Gralnick HR, et al. Proposals for the classification of the myelodysplastic syndromes. Br J Haematol 1982;51:189-99. 2. Bennett JM. A comparative review of classification systems in myelodysplastic syndromes (MDS). Semin Oncol 2005;32:S3-10. 3. Greenberg P, Cox C, LeBeau MM, Fenaux P, Morel P, Sanz G, et al. International scoring system for evaluating prognosis in myelodysplastic syndromes. Blood 1997;89:2079-88. 4. Brunning RD, Bennett JM, Flandrin G, Matutes E, Head D, Vardiman JW, et al. Myelodysplastic Syndromes. In: Jaffe ES, Harris NL, Stein H, Vardiman JW, editors. World Health Organization Classification of Tumours. Pathology and Genetics. Tumours of Haematopoietic and Lymphoid Tissues. Lyon: IARC Press; 2001. 5. Brunning RD, Orazi A, Germing U, LeBeau MM, Porwit A, Baumann I, et al. Myelodysplastic syndromes/neoplasms. In: World Health Organization Classification of Tumours. Pathology and Genetics. Tumours of Haematopoietic and Lymphoid Tissues. In: Swerdlow SH, Campo E, Harris NL, Jaffe ES, Pileri SA, Stein H, et al., editors. Lyon: IARC Press ;2008. 6. Horny HP, Valent P. Myelodysplastic syndromes/neoplasms: Morphological and immunohistochemical features and standard evaluation. In: Varkonyi J, editor. The Myelodysplastic Syndromes. New York: Springer ; 2011. 7. Lambertenghi-Deliliers G, Annaloro C, Oriani A, Soligo D. Myelodysplastic syndrome associated with bone marrow fibrosis. Leuk Lymphoma 1992;8:51-5. 8. Horny HP, Wehrmann M, Schlicker HU, Eichstaedt A, Clemens MR, Kaiserling E. QBEND10 for the diagnosis of myelodysplastic syndromes in routinely processed bone marrow biopsy specimens. J Clin Pathol 1995;48:291-4. 9. Baur AS, Meuge-Moraw C, Schmidt PM, Parlier V, Jotterand M, Delacretaz F. CD34/QBEND10 immunostaining in bone marrow biopsies: An additional parameter for the diagnosis and classification of myelodysplastic syndromes. Eur J Haematol 2000;64:71-9. 10. Horny HP, Sotlar K, Sperr WR, Valent P. Systemic mastocytosis with associated clonal haematological non-mast cell lineage diseases: A histopathological challenge. J Clin Pathol 2004;57:604-8. 11. Valent P, Horny HP, Bennett JM, Fonatsch C, Germing U, Greenberg P, et al. Definitions and standards in the diagnosis and treatment of the myelodysplastic syndromes: Consensus statements and report from a working conference. Leuk Res 2007;31:227-36. 12. Tricot G, De Wolf-Peeters C, Vlietinck R, Verwilghen RL. Bone marrow histology in myelodysplastic syndromes. II. Prognostic value of abnormal localization of immature precursors in MDS. Br J Haematol 1984;58:217-25. 13. Oriani A, Annaloro C, Soligo D, Pozzoli E, Cortelezzi A, Lambertenghi Deliliers G. Bone marrow histology and CD34 immunostaining in the prognostic evaluation of primary myelodysplastic syndromes. Br J Haematol 1996;92:360-4. 14. Thiele J, Quitmann H, Wagner S, Fischer R. Dysmegakaryopoiesis in myelodysplastic syndromes (MDS): An immunomorphometric study of bone marrow trephine biopsy specimens. J Clin Pathol 1991;44:300-5. 15. Agis H, Krauth MT, Mosberger I, Müllauer L, Simonitsch-Klupp I, Schwartz LB, et al. Enumeration and immunohistochemical characterisation of bone marrow basophils in myeloproliferative disorders using the basophil specific antibody 2D7. J Clin Pathol 2006;59:396-402.